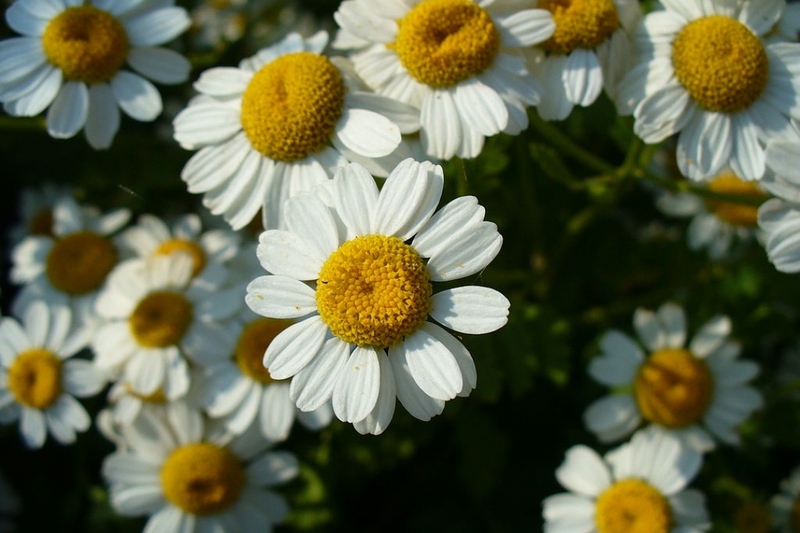 Feverfew ( Tanacetum parthenium): growing, planting, caring. Tanacetum parthenium - the feverfew or bachelor's buttons - is a flowering plant in the daisy family Asteraceae. It is a traditional medicinal herb which is commonly used to prevent migraine headaches, and is also occasionally grown for ornament. Tanacetum parthenium is a herbaceous perennial that grows into a small bush up to 70 cm (28 in) high with pungently-scented leaves. The leaves are light yellowish green, variously pinnatifid. The daisy-like flowers are up to 20 mm across, borne in lax corymbs, with the outer, ray florets having white ligules and the inner, disc florets yellow and tubular. It spreads rapidly by seed and will thrive in almost all conditions, but will prefer sunny exposures and dry soils. Plant preferably between September and the end of November or between March and the end of April, when the winter reserves are formed and the temperatures are not too low. Bury the roots a few centimeters so that the foliage is flush. Fill and pack well around the plant so as not to leave a pocket of air. Water copiously just after planting. If you are planting in a pot, use one whose volume corresponds to that of the plant, otherwise you will have to water it too often. You can use gravel at the bottom under mixture of soil, compost or compost for better drainage.